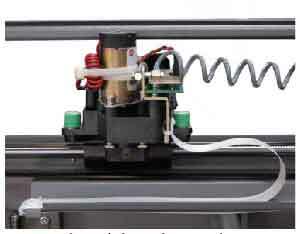 This procedure details steps to replacing the X-Axis rail on the Legend Mini. 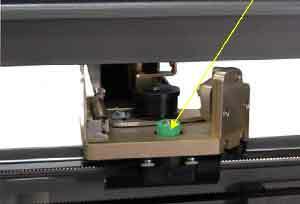 The X-Axis rail guides the laser head from left to right. 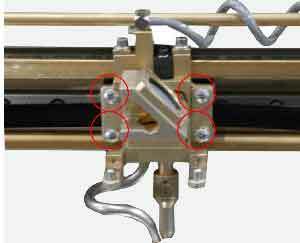 Before starting on this procedure, clean a section of a desk or table to work on because this procedure requires the X-Axis Assembly to be completely taken apart. Unplug the power cord from the machine and the wall. a. Disconnect air intake. 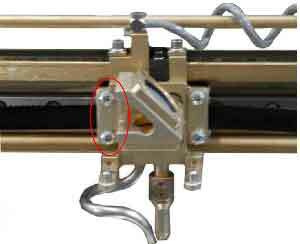 Push in the white ring and then pull the air hose out. b. Clip the white electrical tie around the white ribbon cable. 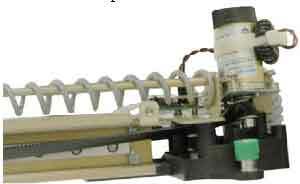 c. Disconnect white ribbon cable. d. Unscrew the green captured screw on the left side of the X-beam. e. Unscrew the two green captured screws on the right side of the X-beam. f. Lift the I-beam carefully. Use caution when lifting the right side of the X-beam. Bring the right side forward a little to ensure the motor clears the frame rail. Place the X-Axis Assembly on a clean table top. Make sure the Laser head does not rest on the table. 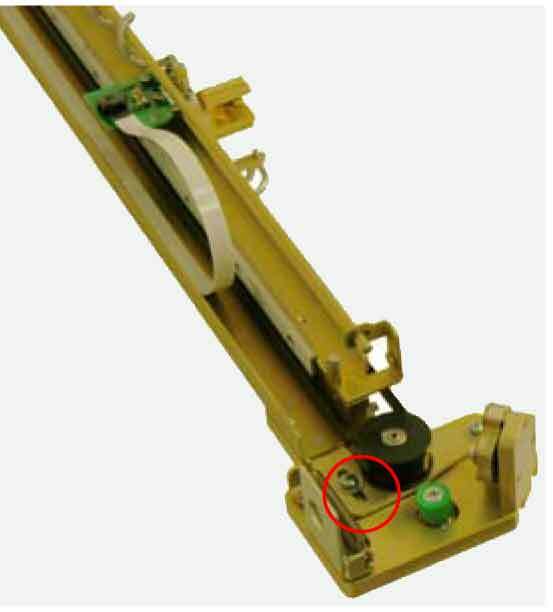 Remove the belt by the unscrewing the four screws on the two belt clamps. 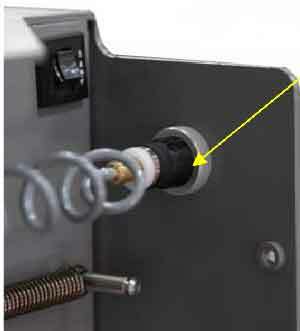 Unscrew the air intake from the laser head. Unscrew the four hexagonal screws with the white stops. There are two of these screws on each side of the X-Axis rail. a. 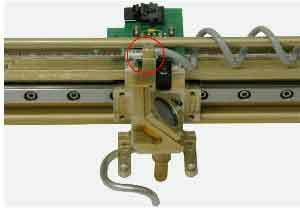 Slide the laser head onto the rail. b. On the right side of the rail there are engravings by the manufacturer. Locate the arrows in these engravings. 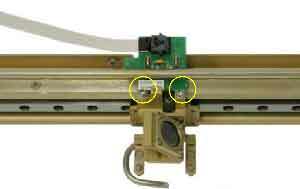 To position the rail point, put the engravings on the right side of the X-beam and point the arrows down. c. While screwing in the 34 3/32 hex screws for the rail, press down firmly on the top of the rail. This will ensure straightness to the rail. d. Screw in the four hexagonal screws with white stoppers. e. Torque the 34 hex screws. Screw in the small control panel to the laser head. Screw in the air intake. ii. Lift the motor out of the bracket. b. 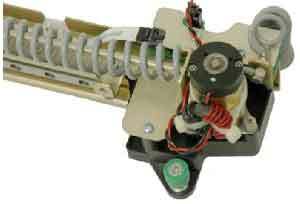 Put the left side of the belt into the right side of the laser head, screw in the plate. c. Loop the belt through the bracket and around the black pulley. Pull the belt to the left side of the I-beam. d. With the index finger loop the belt around the silver spindle of the X-motor. e. Put the X-motor back on the bracket and screw in the three captive screws. f. Loop the right end of the belt around the left side of X-beam. 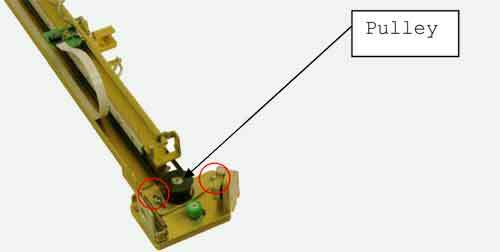 h. Tighten the belt with the pulley system on the left side of the X-beam. Put the X-Axis Assembly back in the machine. Make sure not too hit the frame rails. Screw in the green captured screws on each side of X-beam.